Xiaomi Mi 9 crosses one million registrations mark - Playfuldroid! The Xiaomi Mi 9 which was announced earlier this month will go on sale in China starting tomorrow. Apparently, the device had already fetched more than one million registrations ahead of its first flash sale tomorrow, signifying a strong interest among the Chinese consumers. As a quick recap, the Xiaomi Mi 9 will be available in two different variants. 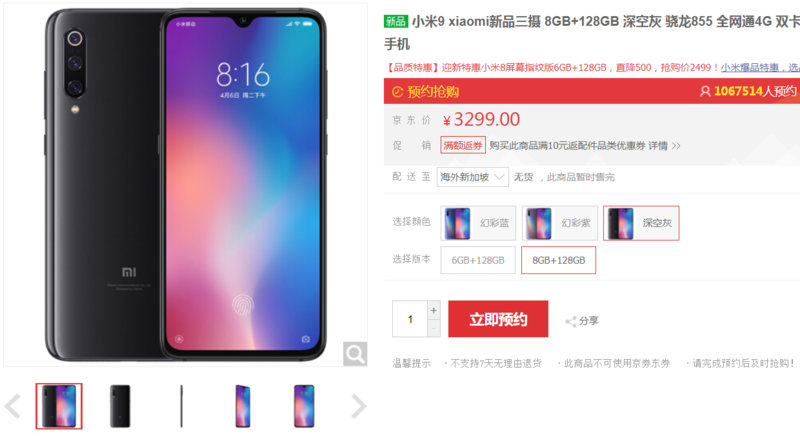 The 6GB+128GB variant will come with a price tag of 2,999 Yuan (US$ 446), while the higher-end model with 8GB+128GB memory configuration will be tagged with a slightly more hefty price tag of 3,299 Yuan (US$ 491) instead. For those who’re interested, the Xiaomi Mi 9 will be available in 3 color options namely Ocean Blue, Lavender Violet, as well as Piano Black.